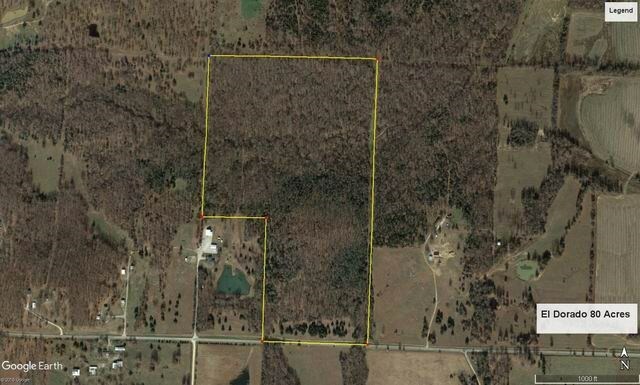 This 80 Acre recreational tract of timberland is located between El Dorado Springs and Collins, Missouri on the Cedar/St Clair County line. The property features a mostly wooded setting with Hwy W frontage, offering the perfect get-away location without the gravel road. The land boasts tremendous hunting opportunity, located only 1/2 mile up the valley from the beautiful Sac River. The most extensive trail system is on this property that I have ever seen. There is literally miles of groomed trails on this 80 acre tract. The access is tremendous for hunting, horse-back riding, or UTV/ATV sport. A pleasant stream also meanders through the property for wildlife attractant and great aesthetics. This area is known for its great deer and turkey hunting, and this property is sure to not disappoint. Finally, this property would make a tremendous building site for anyone who wants to tuck a custom home back into the country hillside. Hunting Land For Sale In Mo. Land For Sale El Dorado Spgs. Timberland for Sale In Mo.